Founded in 1978, INFAR industrial Co., LTD. is a hand tool manufacturer focusing on the professional wrenches and sockets. We are a self-integrated manufacturer with 220 employees in Taiwan, capable of producing more than 25 million pieces of wrenches and 60 million pieces per year. Our total production space is approximately 200,000 square feet in Taiwan. In 1992, INFAR developed China facility in Kunshan that focus on manufacturing wrenches. We are also an ISO 9001, VPA GS recognized company. All of INFAR made products meet and exceed ANSI or DIN spec which covers 4 product categories which are traditional wrench, ratchet wrench, socket and tool set. 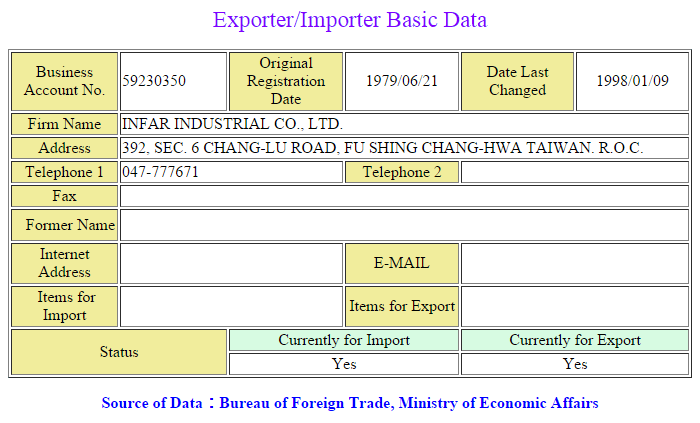 In additional, INFAR is not an OEM corporation but also an OBM provider. GEARTECH, ProGear, INFAR are the brands owned and popularized by INFAR. With an apposite product categories, INFAR turns from a manufacturer to a trader and an agent from 2010. It is now INFAR supplying our goods to multiple handtool markets. There is no best product but better one never end. All the INFAR made products meet and exceed ANSI or DIN spec. They are lifetime guaranteed. For any INFAR made goods returned, we supply new product to replace.